Long ago, I was a first and second grade teacher. I still think and plan in themes, as I did back then. I guess I'm always be wired that way. In my classroom, we had little "centers" or "workstations"- a math center, an art center, a writing center- you get the idea. 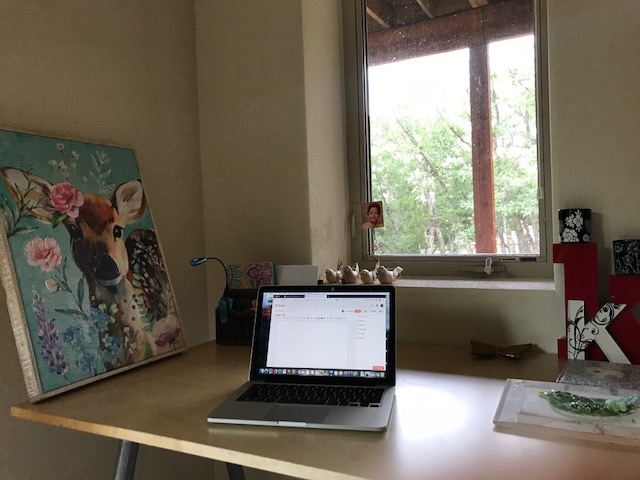 As I've been setting up my dream craft room here in our new home, I've been in full teacher mode I guess, because here I am, happily in my writing center. I haven't hung the art work, but already, it surrounds me and makes me feel so happy. As does the little window of so many trees in our yard. I've always dreamed of a yard with so many trees that there would be too many to count. And now, with that dream realized, I wanted to set up a little writing desk by the corner window that looks out to all the trees. My craft room is a work in progress, but it's feeling pretty sweet so far. I'll reveal more of my centers as I get a little further along.